A team of contact tracers is visiting a community in Conakry, Guinea, after a family member was infected with Ebola. The family has been provided with buckets and chlorine and taught how to wash hands properly at home (January 2015). United Nations Secretary-General Ban Ki-moon will call for continued solidarity with the three West African countries most impacted by the unprecedented Ebola outbreak at at tomorrow's International Ebola Recovery Conference in New York, which will seek to raise $3.2 billion over the next two years so that Guinea, Liberia and Sierra Leone can fully rebound from the crisis. 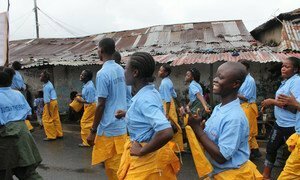 United Nations Secretary-General Ban Ki-moon will call for continued solidarity with the three West African countries most impacted by the unprecedented Ebola outbreak at tomorrow's International Ebola Recovery Conference in New York, which will seek to raise $3.2 billion over the next two years so that Guinea, Liberia and Sierra Leone can fully rebound from the crisis. “Most of the affected region is now free of Ebola,” Dr. Nabarro said of the epidemic that began last year and has affected some 27,600 people, including more than 11,000 deaths, mostly in West Africa. "The numbers of transmission chains have reduced in the last few weeks. There are some new cases, but when they do a merge they can easily be traced back to existing transmission chains," he said. But at the same time, he stressed that the recent discovery of new cases in Liberia is “a reminder of the absolute importance of remaining vigilant until the very end of the outbreak and responding quickly to any new flare-ups when they occur […] and I'm delighted to say that the response to the Liberian recent flare-up has been rapid and effective." But, he said, there is no need to wait to get to 'zero cases' before the recovery process begins, noting that the response and recovery phases of the outbreak are “intertwined” in order to get schools open and running safely and ensuring that health care services are in place and resilient. At the same press conference, Sunil Saigal, Principal Coordinator of the UN Development Programme's (UNDP) Response to the Ebola Outbreak, spoke about the need to build resilience in these countries to lift themselves up and return to the state of the development they were in before the Ebola crisis. Mr. Saigal said the technical consultations started today, led by the three impacted countries, which focused on discussions on the recovery process such as health, governance, and sanitation. Finance ministers, as well as other senior representatives of Guinea, Liberia and Sierra Leone, made their presentation of their 24-month recovery plans. In addition, the Mano River Union presented a regional recovery plan. He said the current funding gap identified by the three countries to help rebuild sustainable structures and systems over the next 24 month is $3.2 billion. “The commitments and resources mobilized by this Conference will ensure that the building blocks of sustainable recovery are put in place,” according to UNDP. The presidents of the affected countries, as well as Robert Mugabe, current Chair of the African Union, and high-level representatives from the African Development Bank, the European Union, the Islamic Development Bank and other partner organizations in the response are expected to participate in the morning portion of tomorrow's conference. The pledging segment in the afternoon will be chaired by UNDP Administrator Helen Clark. Also present will be Dr. Margaret Chan, Director-General of the World Health Organization (WHO), and other UN agency representatives who will give updates on the response. The conference tomorrow is scheduled to be followed by an AU event to take stock in Malabo, Equatorial Guinea on 20 July. The origin of the new cluster of Ebola cases is “not yet well understood,” the United Nations World Health Organization (WHO) said today about the outbreak in West Africa where a residual lack of trust in the response means that some cases still evade detection for too long, increasing the risk of further transmission.